Questo è un articolo che mi ha sempre ispirato fin da quando ho incontrato il suo autore ed ho letto la sua “bibbia”. Anche adesso in alcune occasioni anche molto personali sento il bisogno di rileggerlo. Throughout the course of my extensive interaction with world class performers, seven critical components of personal excellence have continued to surface as the essence of excellence. These basic elements of excellence allow you to excel or become the best you can possibly be in your chosen pursuit. The first two elements are Commitment and Belief. Together they form the hub or heart of human excellence. These two elements of excellence encompass your overall perspective or orientation towards excellence, the way you view yourself, your capacity and the importance of your pursuit, and your desire to become your best. Your commitment or passion for your pursuit, your willingness to work hard and persist in the face of challenges and obstacles, and the extent to which you grow to believe in yourself and what you are doing are critical components of excellence. The five remaining elements of excellence, presented as spokes on the Wheel of Excellence, are : Full Focus, Positive Images, Mental Readiness, Distraction Control, and Constructive Evaluation . 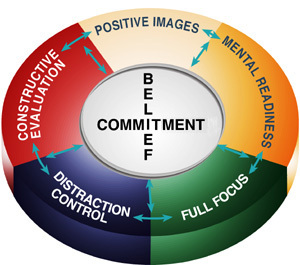 These five spokes of excellence are mental skills that channel commitment and belief into a series of positive actions that make your performance wheel run smoothly and efficiently. Each of the seven elements of excellence is discussed below. Everything I do, whether it is weights, or running, or the normal training things, or the leisure activities I do, is all geared toward how it’s going to affect my performance. Everything is opportunity/cost. If I go out to a movie instead of going hiking as my leisure activity, what is the cost of that? If I go to the movies instead of a hike, does that help or hurt my performance. I’ve got to judge that. I’ve always thought this way. I have always dreamed about being the best in the world. Maybe that’s different from other people. ( Larry Cain – Olympic Champion – Canoeing) It’s committed through the ups and downs. Committed through the good results and the bad results, when you’re coming in 50th and it looks like there’s never an end to the bad results. to give everything of yourself you can give. Commitment is the first essential ingredient guiding the pursuit of excellence. To excel at anything you must have or develop an extremely high level of dedication, self-discipline, passion, joy or love for what you are doing. You must truly commit yourself to be the best you can be and continuously strive to make personal improvements and meaningful contributions. Excellence requires an incredible commitment to persist through the ups and downs associated with becoming your best and maintaining your best performance. You must ignite something within that drives you to excel. You must not only commit yourself to the goal of excelling, but must also commit yourself to act on a daily basis in ways that lead you to excel. This includes committing yourself to engage in ongoing, high quality preparation (mental, physical and technical) and committing yourself to give your best for the entire performance. It means setting clear personal goals and relentlessly pursuing them. To excel at the highest level, commitment moves to the point at which the pursuit itself becomes the center of your life, at least for certain extended periods of time while you are engaged in preparation and performances. The world’s best performers carry an extremely high level of commitment or passion for their pursuit. This is required to attain the highest levels of excellence. For consistent high level performance you must commit not only to high quality training and maximum performance, but also to adequate recovery. Allowing enough time for physical and mental regeneration is a critical part of high quality performance. You must learn to “train smart” and listen to your own body. You must respect your basic needs for relaxation, rest, regeneration, sleep, good nutrition and joyful moments away from your performance domain. If your needs for rest and regeneration are not respected, you are susceptible to over-training, loss of focus, inconsistent performance, chronic fatigue, irritability, illness, and injury. What you do away from the performance arena has a tremendous effect on what you do in the performance arena. One of the greatest challenges of ongoing excellence lies in respecting changing needs and ensuring that your current commitment is directed toward benefiting you and your ultimate goals. This requires that you establish a positive personal balance between quality training/performance and quality rest/relaxation. It also means that you adjust the balance as necessary, as you move along your path of personal excellence. The single-mindedness that allows you to attain the highest levels of excellence is not necessarily what allows you to continue to excel. Ongoing excellence requires that you respect your individual needs and carry a focus that frees you to perform. Once your technical or physical skills have become highly polished, your commitment must be balanced with trust, rest and joyful diversion to avoid overload. This will allow regeneration and enable you to return to the performance arena feeling energized, positive, confident and focused. Belief is the second essential ingredient in the pursuit of excellence. Excellence is guided by belief in your potential, your goal, the meaningfulness of your goal, and trust in your capacity to reach that goal. To excel, you must believe that you are investing in something worthwhile and that you have a good chance of making it happen. Belief in yourself, your teammates, and your mission all enhance commitment. Your overall depth of confidence and commitment is strengthened when you believe in the people and/or organization with whom you are linked in pursuing your goal, and when you know these people value you, believe in you and are committed to your goals and development. Individuals, teams, groups and organizations do not excel in a vacuum. They need the stimulation and support of other good people to excel. Most people need at least one person who believes in them, makes them feel competent, loves them or supports their goals and dreams. Excellence within teams or groups occurs most readily when you have an unwavering commitment to a common goal, when you genuinely believe you can achieve the goal, when each team member feels he or she has a meaningful role to play in pursuing that goal, when you are treated with respect, and when there is a strong sense of ownership, collaboration and mutual support in pursuing the goal. Respect and mutual support directly affect commitment and belief. Being treated with respect and challenged in positive ways enhances your commitment and your belief in your capacity to excel. Anything that strengthens belief frees you to perform at a higher level. Belief in yourself and confidence in your capacity allows you to extend your limits, create your own opportunities and push through performance barriers. Where there is unwavering belief in your capacity to carry out a mission and absolute connection with your performance, doors are opened to higher levels of excellence. When negative thoughts interfere with trust, performance wavers. In the same way that belief can unlock doors, doubts can place limits on possibilities and potentials. In the presence of belief your performance blossoms; in its absence you never touch your potential. The extent to which you grow to believe in yourself is dependent upon the extent to which you live and experience concrete events that serve to enhance your belief. Belief in yourself is strengthened when you think and act in positive ways. The development of a strong sense of confidence in yourself is nurtured when you: engage in thorough high quality technical, physical, and mental preparation; experience success in training simulations or performances; look for the positive parts of all performances; talk to yourself in positive ways about your experiences and capacity; and continuously draw out constructive lessons to improve and refine the quality of your performance. People rarely begin sport or other high performance pursuits with total belief in their capacity to execute tasks with precision. You often do not know what you are capable of doing. Rookie surgeons in an operating theater and rookie athletes in a competition arena acquire belief through experiences in the performance and practice arena from which they learn and grow. Belief is strengthened by experiencing improvement and success, learning from others, receiving positive, constructive feedback, and feeling the support of others. Belief is further strengthened by developing essential mental skills associated with excellence. Each of these mental skills serves to enhance the quality of preparation and the consistency of your performance in “the arena,” all of which enhance belief. As mental skills are strengthened, confidence is strengthened and commitment is enhanced. As commitment rises, you often act in ways that further enhance your belief and the level of your performance. Belief is a two- way phenomenon. It opens the door to higher levels of excellence, and higher levels of excellence open the door to higher levels of belief. You may occasionally perform well without fully believing in yourself, but to excel to your potential your sense of trust in yourself must reach a high level. Focusing is the single most important mental skill associated with performance excellence. Focusing refers to the ability to concentrate totally on what you are doing, seeing, reading, hearing, learning, feeling, observing or experiencing while you are engaged in the activity or performance. Focusing fully not only allows you to connect totally with what you are experiencing, but also frees you to perform without being disturbed by distracting thoughts. Your skill at focusing affects your rate of learning as well as the quality of learning, practice, preparation, and performance. Your ability to direct and control your focus also affects your level of activation and relaxation. You control the volume, intensity, direction and persistence of your actions and reactions through your focus. To perform effectively, especially in situations that count, a refined ability to focus fully on the right things (i.e. the things that “work” for you) is essential. The successful execution of all mental skills on the Wheel of Excellence is dependent upon your ability to focus appropriately. Each of these mental skills provide ongoing opportunities to practice and refine your focusing skills. The extent to which you can fully focus on the right things for the duration of your performance is the single most important on-site mental skill affecting skilled performance. You must learn to connect totally with your performance, and trust yourself to perform as you have been trained to perform. You must free yourself from unnecessary internal or external interference to step into the zone for high level performance. Connected focusing is the core of skilled human performance. The mental skills and perspectives on the Wheel of Excellence are all directed toward empowering you to enter this fully focused performance zone on a consistent basis. To achieve your performance potential, you must become highly accomplished at focusing only on what is within your immediate control to the exclusion of irrelevant thoughts, distracting input, or thoughts about the outcome of your performance. You must connect totally to executing the immediate task at hand. You must free yourself to let your performance unfold naturally. The single most important mental goal for the successful execution of all performances is to train your mind and body to the point that you can connect fully for the duration of your performance. Focus in the present, in “the here and now” for the duration of the action-oriented part of your performance. During breaks in the action or when you are away from the performance arena, take advantage of opportunities for “mental time outs.” A simple positive shift in focus to something less demanding or more relaxing can allow you to relax and return with an effective performance focus. Your focus is the leader, the play maker, helmsman, quarterback, point guard. Where your focus goes, everything else follows. Focus leads activation, anxiety, relaxation, learning, mental readiness, personal growth and performance excellence. Let it lead wisely. Positive imagery is useful for guiding your belief, focus, and performance, and for creating good feelings about yourself and your capacity. Through positive imagery you can pre-experience and re-experience feelings, sensations, skills or actions that are important for the successful execution of your task. High quality images of high quality performances allow you to experience yourself following desired courses of action and help you to feel ready to perform to your highest potential. These multi-sensory images take you where you want to go and often where you have not yet been. The specific nature of your pursuit and your personal history will dictate the content of your imagery and the extent to which you draw upon different senses. However, those who attain the highest levels of excellence experience clear, positive, process-oriented performance images as real “feelings” in their mind/body. The world’s best performers (e.g. athletes, surgeons, astronauts, and classical musicians) have highly developed imagery skills that they use daily They draw upon these skills to: prepare themselves for high quality performances, recall and refine technical skills, make corrections, relax, experience themselves as successful and in control, regain control when struggling, set a positive frame of mind and create a high quality focus. Mental readiness refers to a positive state you carry into learning and performance situations. It is dependent upon the other mental skills on the Wheel of Excellence. To have a realistic chance of excelling you must become highly proficient at mentally readying yourself to: learn essential mental, physical and technical skills, practice essential skills to perfection, and effectively perform those skills under competitive conditions. Personal excellence requires that you become proficient at getting the most out of your daily learning and living experiences. This begins with a commitment to make the most of each learning and performance opportunity. Excellence demands that you develop an effective way to enter a high-quality, focused, performance zone on a consistent basis. You need an effective mental plan that is capable of bringing you to a heightened state of readiness for learning and performance. Positive images, positive thoughts, and specific reminders about what you want to do and how you can best focus to do it are normally incorporated into this mental readying process. To excel at learning, performing, or living, you must project an openness to learning and a commitment to ongoing personal growth. You must engage yourself in a continual process of self- discovery, and act upon those discoveries that lead you to your best focus and best performances. Your focus is the leader. When you discover what works best and feels best, you must follow that path, even in the face of obstacles from others who may dictate another path. Consistent high-level performers are great at following their own best path. They carry a positive perspective, respect what works best for them, focus fully and continue to look for ways to improve. This path becomes so natural for some great performers that they are able to follow it consistently without much conscious awareness. stay on your own best path for personal excellence. Distraction control refers to your ability to maintain or regain a positive, effective focus when faced with potential distractions, negative input, or setbacks. These distractions may be external, arising from your environment, or internal, arising from your own thinking or expectations. Maintaining and regaining a constructive focus is a critical part of performing to your capacity on a consistent basis, whether distractions occur before, during, between or after events. Developing your ability to refocus in a positive direction is an extremely important factor affecting the consistency of performance in all domains. When you experience lapses in concentration or setbacks during a performance, the goal is to quickly regain a fully connected focus. This is made possible by planning to refocus and refining your ability to use cues, images, or reminders to rapidly refocus on what is within your immediate control in the present moment. Once you have developed the ability to fully focus on your task (even for moderate periods of time), distraction control (or refocusing) becomes the single most important mental factor affecting the consistency of high level performance. act upon the lessons learned. Excellence requires that you develop an effective process for personal evaluation, and that you act upon the lessons drawn from these evaluations. Constructive evaluation includes looking for the good things and targeting areas for improvement in yourself, your performance, your environment and your experiences. You can draw inspiration, confidence and joy from reflecting on positive experiences and personal highlights. Important lessons are gained by evaluating your overall performance, critical portions of your performance, and the role your mental state played in your performance (e.g., mental readiness, trust, distraction control and sustained focus). Constructive evaluation of mental and physical performance skills requires two things, 1) reflecting on what went well, and 2) targeting areas for continued improvement. Through experience, top performers have developed constructive evaluation procedures that are highly individualized and personally effective. This guides their continued pursuit of excellence. To achieve your highest performance level continue to evaluate your preparation and focus. The lessons extracted can be written down, discussed, or mentally reviewed. The important point is that you develop an effective evaluation procedure to pull out lessons, and act upon those lessons on a consistent basis. Your rate of learning, as well as the performance level you ultimately attain, is directly affected by the extent to which you engage in thorough, ongoing, constructive personal evaluation. The most striking finding in our series of interview studies with people who excel in different pursuits was the extent to which they had similar mental skills and perspectives. Exceptional Japanese athletes, all of whom were Olympic or World Champions, had performance perspectives and mental skills that were very similar to exceptional athletes in Canada and the United States. Exceptional surgeons and astronauts in North America had performance perspectives and mental strengths similar to exceptional classical musicians in Europe. There are individual differences with respect to how these mental skills are combined, utilized, and orchestrated, but the Wheel of Excellence is evident in virtually all of the most exceptional performers. Some may utilize certain components more than others, and some may be more spontaneous or more systematic in their preparation and application of these skills. For example, top classical musicians found spontaneity, flexibility and creativity to be an important factor in their mental readiness to perform. Some performers may need to focus more on mentally preparing themselves to “read” and react quickly. This is true for individuals in team sports, combative sports and others facing situations that demand quick, accurate responses to changing situations. Appropriate action and reactions in these pursuits is led by thorough mental preparation and trust in your ability to react automatically. Some performers emphasize the importance of fun, passion or enjoyment in their pursuits. This enhances their level of commitment, focus and the extent to which they remain positive within their pursuit. In a study with NHL hockey players, almost all players mentioned the importance of fun and enjoyment in their pursuit of excellence . Top classical musicians also spoke of the power that an ongoing sense of joy and passion plays in embracing their musical pursuits.. Regardless of individual preferences, performers in all domains perform their best when they have fully functioning Wheels. The combination of commitment and full focus appear to be the two most essential daily mental links to excellence. Commitment provides the drive to do the extensive work that is required to excel, and focus directs the quality of learning and performance in meaningful ways. Performers will not come close to their highest levels of excellence without developing a tremendous commitment and a great focus. The seven elements that make up the Wheel of Excellence are closely linked and often operate interdependently. Focusing has the capacity to strengthen every other element and each has a role to play in nurturing excellence. Commitment provides the fuel that leads you along the path of excellence day-by-day. Belief in your potential provides the inspiration to pursue your dreams. Commitment nurtures belief and belief strengthens your commitment. Together they open the door to new realities. The mental spokes on the Wheel translate your commitment and belief into positive action. They are the working parts of the Wheel that ensure you roll forward in a positive direction. Clear positive images of where you want to go and how you will get there give concrete direction to your commitment and belief. They provide a specific path and visible goals, and thereby guide your pursuit of excellence. Focusing takes you down this path, day-by-day, step by step, moment by moment. Focusing on the right things at the right time makes excellence and new realities possible. Mental readiness prepares you to enter your performance arena at the right moment and in the right frame of mind. It allows you to be consistent with high level performance. Distraction control keeps you on your desired path and gets you back on track when you stray away. Constructive evaluation ensures that you continue to learn and grow by drawing out positive lessons along the way, and act on them every day. Developing the seven elements of excellence empowers you to journey where you have never been before. We fall short of our personal potential in sport, school, work, relationships, health, and life when our mental wheels are running with underdeveloped or untapped parts. Either the heart of commitment and belief is not strong enough, or one of the five mental spokes is not being fully utilized. This results in an inconsistent or shaky wheel, and shaky wheels do not lead you to personal excellence. The goal of personal excellence is to do everything in your power to fulfil your own goals and dreams. This may include raising the level and consistency of your performance, experiencing a greater sense of joy or satisfaction in your personal and professional pursuits, and enhancing the quality of your life. Everyone begins at a different place with respect to personal assets. When you develop and stretch those assets to the limit, even for short periods of time, you touch personal excellence. The Wheel of Excellence can serve as a guide in your own pursuit of personal excellence. Decide where you are strong and where you need strengthening. Target areas for personal improvement and work at it. The following questions may help in clarifying your direction. Are your goals clear, challenging and targeted at being your best? Do you work at improving something every day , in every practice, in every performance? Is your commitment to training, practice or preparation strong enough to take you to your high level goals? Is your commitment to respect your personal needs for rest, balance, recovery, and good nutrition, strong enough to take you to your goals? Do you believe in your capacity to reach your goal(s)? Are you putting yourself in situations that give you the greatest chance of believing in yourself and achieving your goals? Do you think and act in ways that make you feel positive and confident? Do you have a plan to get there – Do you trust your plan and your preparation? Will you free yourself to let good things unfold? Do you know what focus works best for you? Do you have a plan to consistently get into your best focus? Do you work at improving your focus? How? Do you focus on doing the little things that work best for you every day, for the duration of your performance? Do you imagine yourself performing (or interacting) the way you would ‘ideally’ like to be. Do you imagine yourself achieving your goals? Do you imagine yourself doing the little things that will allow you to achieve your goals? Do you “wake up” your positive images by acting in ways that will take you a step closer to your goals each day? Do you carry a perspective that centers on ongoing learning and growing? Do you mentally prepare yourself to live and perform your best? Consistently? Do you trust yourself to free your performance unfold? Do you remain open to the creativity of the moment and the dynamics of the situation? Do you carry a perspective or focus that allows you to avoid, minimize, or take control of distractions? Do you carry a performance focus that allows you to maintain your best focus even when faced with setbacks or distractions? Do you prepare yourself to flow through distractions, and focus on quickly regaining control when faced with performance errors or setbacks? Do you draw lessons out of every experience or every performance (i.e. what went well and what needs refinement)? Do you re-run the things that you want to improve by correcting them in your mind? Do you reflect upon the role that your mind-set and focus played in your performance? Do you act on those reflections? You can apply these questions and the seven elements of excellence to any area of your life. The Wheel of Excellence is relevant to anything that is important in life. I wish you the best in your quest to make it run wisely and smoothly.